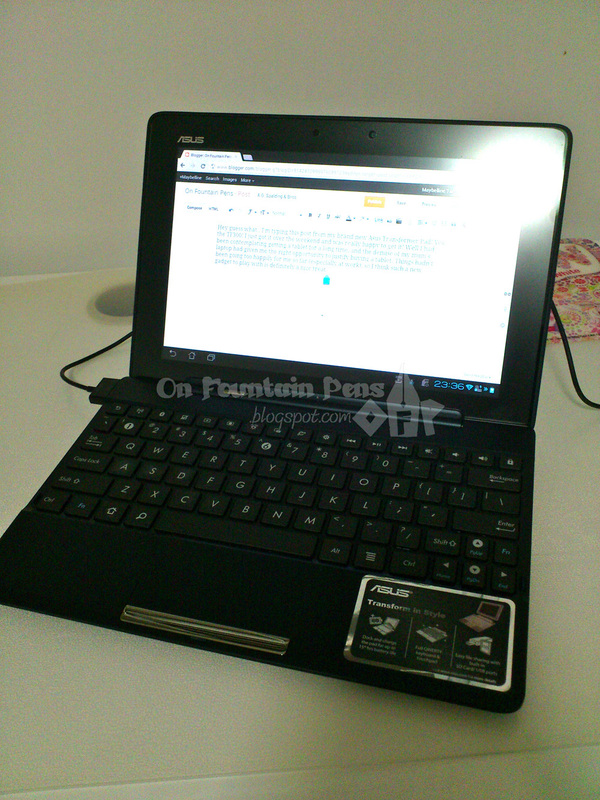 Hey guess what.. I’m typing this post from my brand new Asus Transformer Pad! Yes, the TF300! I just got it over the weekend and was really happy to get it! Well I had been contemplating getting a tablet for a long time, and the demise of my mum’s laptop had given me the right opportunity to justify buying a tablet. Things hadn’t been going too happily for me so far (especially at work), so I think such a new gadget to play with is definitely a nice treat. 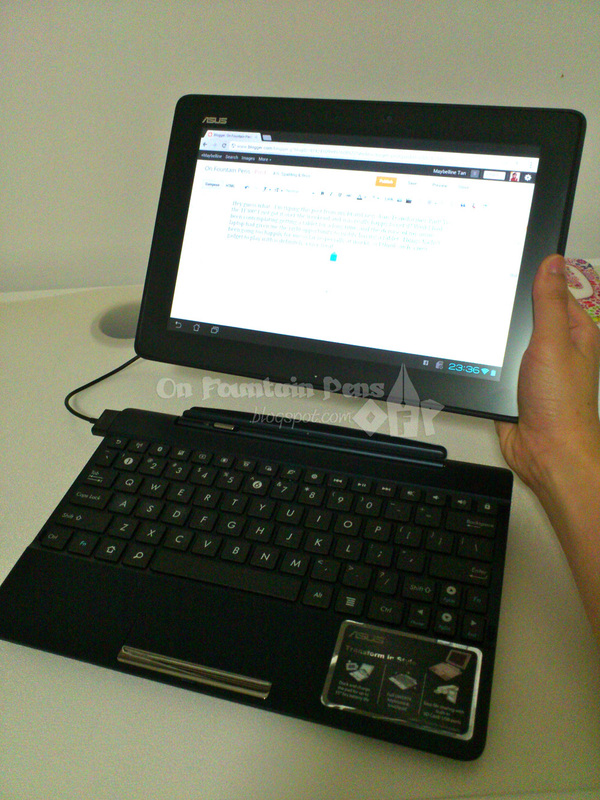 … and a tablet when disconnected! Alright, let’s get back to the topic of stationery. 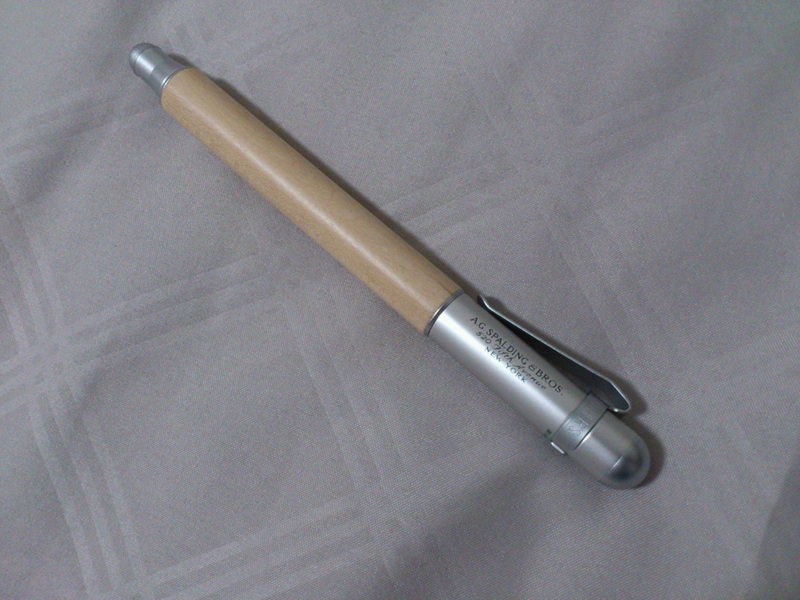 Some time ago, JetPens has sent me a little parcel containing one pen. I could feel the pen in the envelope when I got it out of the letterbox. When I took the pen out, oh boy! 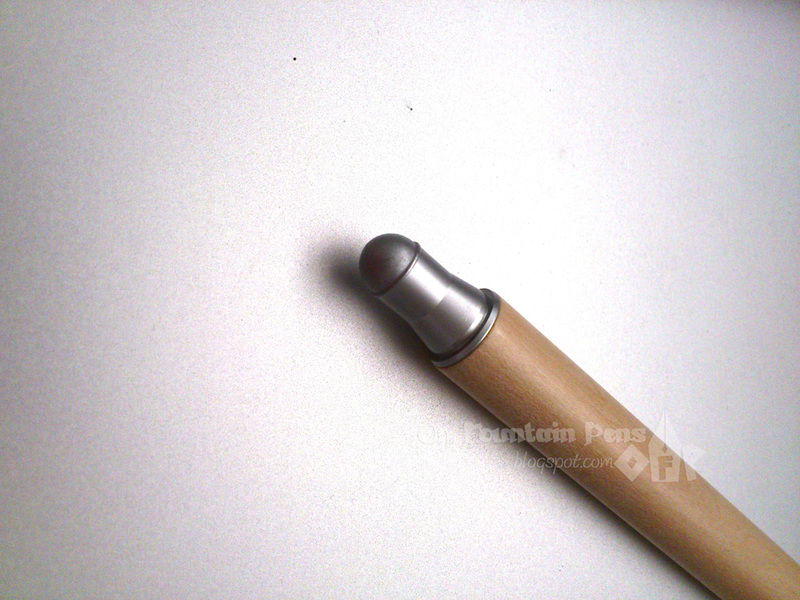 It is a fountain pen with a wooden body! 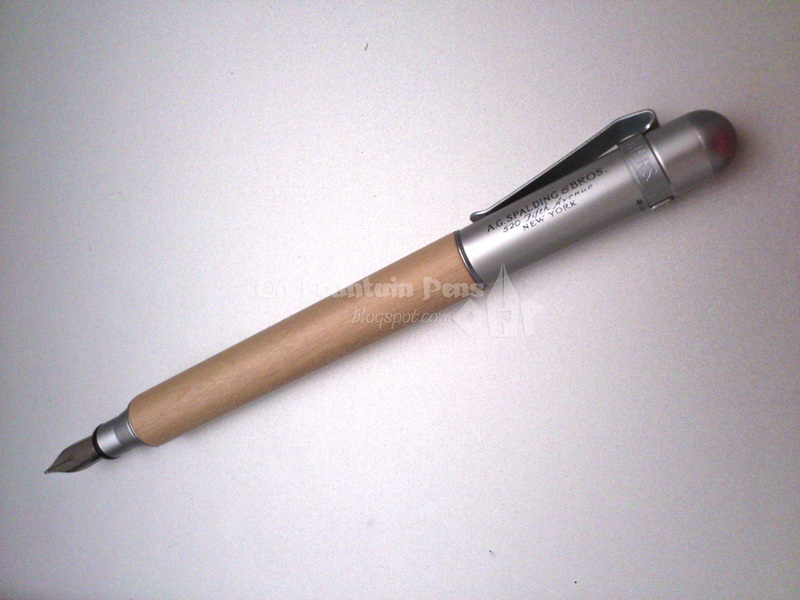 Dearest JetPens, how did you know that I love such wooden pens? You must be geniuses! Totally in love with this pen. Absolutely happy! Comparing this with my previous review of an unknown-brand wooden fountain pen, this pen is different in that the metallic parts are made of aluminium. This makes the pen feel light overall. There is no upset of balance in the weight, or centre of gravity, or whatever, although I would say that the pen is slightly heavier on the cap side (that is, when the pen is capped). 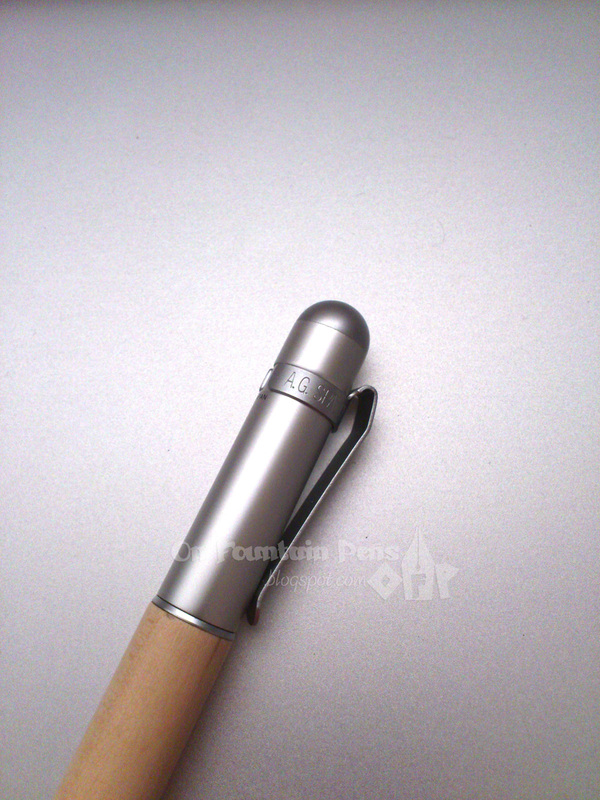 With the aluminium cap, section and end, it reminds me a little of the Muji fountain pen. 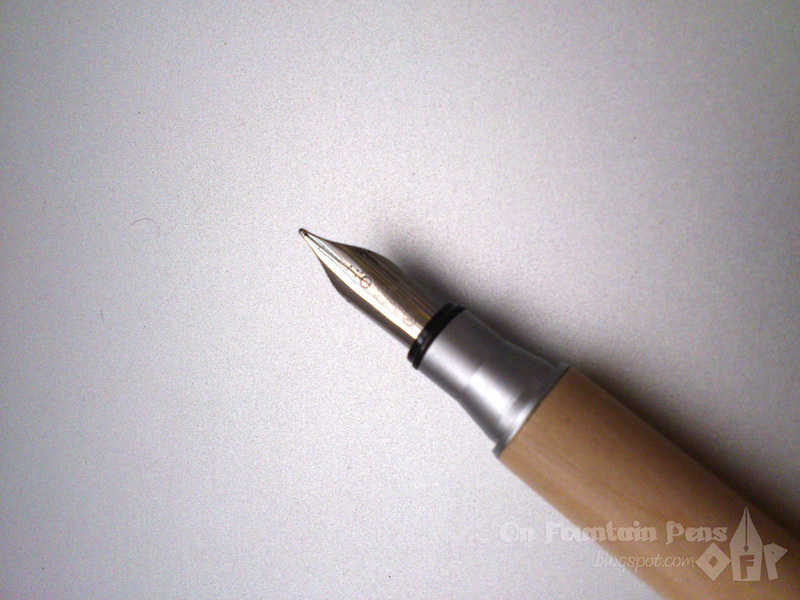 I liked the Muji fountain pen, but add in a wooden body, I guess my rating of the design doubles! I would never really think of combining aluminium with wood. On one hand, aluminium gives a very modern or even futuristic feel as a material. On the other hand, wood is conventional and natural, which isn’t really like aluminium. So the clash in characteristics actually succeeded to create harmony in this pen! But then again I think it is important to choose the correct colour of wood for such a combination. Darker wood colours would probably not have such an nice effect after all. Let’s talk about the pen starting from the back end. When I showed this pen to people, the first thing they asked was always: “So this can also be used as a stylus?” To be honest, when I got this pen I actually experimented with it on my mobile phone, and felt stupid when it didn’t work (fortunately it’s got a screen protector). Really, I think I was expecting too much. This is not a capacitive stylus, but just an interesting design, probably made this way to fit into the cap when you post it. If this were a pencil, I would think that the round part would make a nice shape for an eraser. Yes, erasers on pencils should be round instead of having sharp edges… The cap posts with a distinct click, so that you know it’s secure. Very secure. You actually have to put in some effort to post the cap. Now for the body. It’s quite cylindrical, and since the aluminium parts of this pen reminded me of the Muji Aluminium round fountain pen, I couldn’t help but compare the two pens. This one is slightly fatter than the Muji, which is slightly longer. Both pens have very cylindrical bodies, but the A.G. Spalding and Bros ones has at least some special design on the posting end! The clip looks like a clip-on type itself, with the brand name engraved around it. It hugs the cap really tightly! I thought it was just slipped on around the cap but it seems totally glued to it. I tried removing it, or even simply -moving- it, but it wouldn’t budge. Oh well, never mind then. Once again, I am not such a ‘clip’ person so, as long as it is not spoilt, ugly, or getting in the way, I usually don’t bother too much about it. When you uncap the pen, you will see a simple steel nib at the end of an aluminium section which somewhat imitates the other end of the pen. 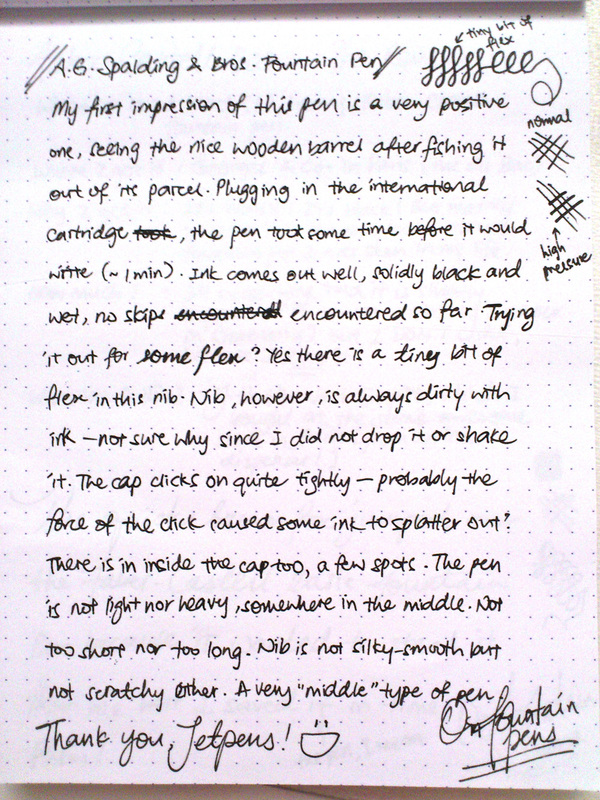 The nib is not so special – just a plain-looking nib with “A.G. Spalding & Brothers (M)” engraved very faintly on it. If you’re looking for a plain-looking nib, this is a good pen for you, because the engravings are hardly visible. If you’re looking for a fancy nib, this is definitely out. While using this pen, I found out that everytime I uncap the pen, there would be spots of ink all over the nib. I always cleaned off the nib and the inside of the cap, but it always happens. I wonder why. This nib sweats often, it seems! I wonder if it is because of the force of the capping. The cap is rather tight, so when you cap it you have to use a slight bit of force. Perhaps that is what’s sending the ink droplets flying around the nib area? The ink I am using is an international black ink in a cartridge, which is generally quite well-behaved, so I doubt it is the ink’s problem! A writing sample! The ink flows generously from this nib, which is something I really like. I like generous nibs and generous people like JetPens! The black that comes out is very saturated and wet. It’s great if you like wet nibs like me, but also since I am a left-hander, it also means that there will be a great deal of smudging when I write across a page. This is especially so with this Rhodia paper. The nib is almost hard as a nail, but with enough force you can get it to flex a bit. But I don’t advice to try, because it would be too tiring! I have a pen that gets ink spots on the nib too. Only mine has a screw on cap! But every time I use it I clean the nib, replace the cap, carefully, and put the pen somewhere safe, carefully, but the next time I go to use it the nib's spotty again. I have never understood how this happens (and I like to keep my pen nibs clean, so it's a bit annoying).